Note: The information provided on this webpage is of a general nature and does not constitute legal advice. Moreover, it addresses only some open-source issues. If you have questions about the law applies in a particular situation, you should consult a lawyer. The basic idea behind open source is very simple. When programmers can read, redistribute, and modify the source code for a piece of software, the software evolves. People improve it; people adapt it; people fix bugs. Open source development is ideally suited to the infrastructure of the Internet and is becoming increasingly ubiquitous. It has the potential to move at speeds that put proprietary software development to shame. What is the difference between open source software (OSS) and proprietary software? Open source software is software where the source code is freely available. Users are free to make improvements and redistribute as long as they abide by certain conditions (see How does an open source licence work?). The most famous OSS is the operating system, Linux. Conversely, the source code for proprietary software is generally kept secret. A user purchases only the compiled version of proprietary software and has no choice but to use the software 'as is'. What is the difference between source code and compiled code? Source code is the high-level programming language that human programmers use to build computer programs. Anyone educated in a particular programming language (e.g. C++, java) can understand and edit source code in that language. Compiled code is source code translated or compiled into a language that computers can understand (compiled code is also called binary code). Humans can not understand or edit compiled code. Even specialized programs, designed to reverse-compile, cannot reproduce perfect source code from compiled code. How does open source software development work? Sir Isaac Newton is famously quoted as saying: If I have seen further it is only by standing on the shoulders of giants. Open source software development embraces this principle. Open source is a community-centric development model, which encourages the free flow of knowledge and insight between all members. The open source model does away with organizations and central control, replacing them with open networks of individuals. Every individual can build on the work that has been done by others in the network; no time is spent reinventing the wheel. Figure 1: The Open Source Model: Source code is available to public. The public is free to make improvements. 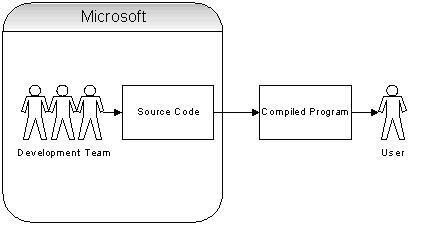 Figure 2: The Closed Model: The Microsoft source code is closely guarded. The User only receives a compiled version of the software. Modification is impossible. In recent years, the linking of individuals has been enhanced by the Internet's high-speed data capacity and omnipresence. With efficient networking infrastructure in place, the collaborative open source model has limitless potential. In fact, over the last decade open source software licences have been embraced internationally and are already in force for thousands of computer programs. In 1984, Richard Stallman started the GNU project. The GNU project's goal was, simply put, to make it so that no one would ever have to pay for software. The first step was to develop a complete UNIX style operating system, the GNU system. The GNU system would become the first 'free' software. What does society need? It needs information that is truly available to its citizens---for example, programs that people can read, fix, adapt, and improve, not just operate. But what software owners typically deliver is a black box that we can't study or change. Society also needs freedom. When a program has an owner, the users lose freedom to control part of their own lives. And above all society needs to encourage the spirit of voluntary cooperation in its citizens. When software owners tell us that helping our neighbours in a natural way is "piracy", they pollute our society's civic spirit. How does 'free software' differ from 'open source'? The difference between the movements is not concrete. The 'open' collaboration model used for software development is the same for both free software and open source. The only pronounced distinction is ideological. 'Free software' software development is motivated by an altruistic desire to improve society at large; society comes first and individual commercial gain is a distant second (to put it mildly). 'Open source' development is motivated by a belief that the development model is superior to proprietary models. The open source movement is an offshoot of the free software movement. It puts a more pragmatic, less dogmatic face on the development model, making it more palatable to mainstream developers. Nevertheless, much of the present success of the 'open source' movement is due to the Free Software Foundation doggedly championing the framework. How does an open source licence work? Traditionally, copyright has been employed to reserve all copyright for sale (all rights reserved) in connection with an original work. Conversely, an open source licence is a legal instrument used to make a work freely available. The term 'free' does not mean free of charge. It refers to a user's freedom to run, copy, distribute, study, change and improve the software without the payment of a royalty or obtaining express permission. Open-source licences make use of the copyright rights applicable to computer programs to secure several standard conditions. Anyone can copy, distribute, and modify open source software as long as they abide by the conditions. The conditions ensure that successive developments of source code may remain available for additional improvement. Anyone violating the conditions may be subjected to legal repercussions under copyright law. How does software qualify as open source? OSS software must make its source code freely-available. Royalty-free distribution of source code is integral to open source development. Without the source code, improvement on existing software is impossible. The other fundamental requirement for open source software is that a user must be able to modify or otherwise create derivative works. Though not a requirement to qualify as an open licence, many OSS licences, such as the GPL, also make sharing-alike mandatory. This means that in exchange for a user being able to build upon or modify existing OSS, the user is required to make the new software, the derivative work, available under the same licence as the existing OSS. These types of open-sources licences are referred to as copyleft. Licences which do not stipulate that a licence analogous to the parent is required to be placed on derivative works are called non-copyleft licences. They do not carry any restrictions on derivative works. Both copyleft and non-copyleft are open source licences. Figure 3: Copyleft licencing: an open source licence (like the GPL) becomes attached to every program that incorporates open source code or code derived from open source code. 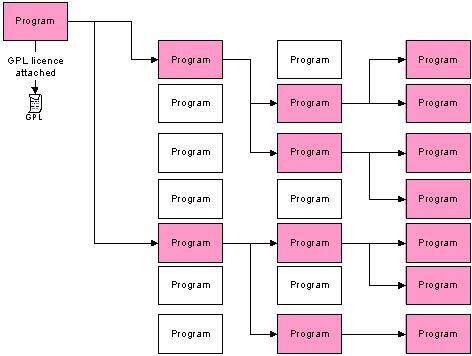 Pink programs have come under the jurisdiction of the GPL. While mandating that 'sharing-alike' is advantageous to the free software community because it ensures that no one can build upon the community's code base without contributing their own modifications back to the public commons, it is also important that people be given the choice to use non-copyleft licences. What is the difference between the open-source licences? The expansive suite of open-source licences vary in restrictiveness and specificity. On the relaxed end of the spectrum is the Berkeley Software Distribution (BSD) licence, which allows licencees to create private derived works (i.e. 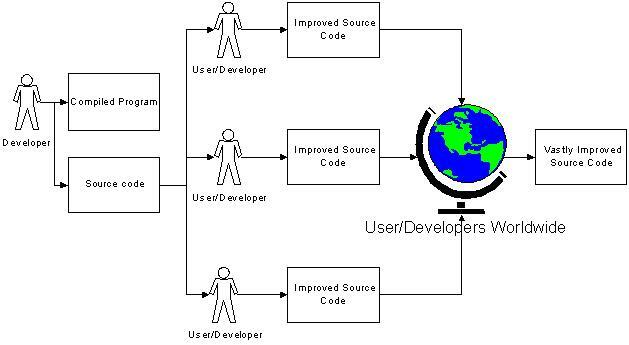 commercial software with unpublished source code) and does not require that changes to the public version be published in any form. On the other end is the GNU General Public Licence (GPL) licence, which creates an obligation to distribute, without fee or additional licence terms, the source code of all derivative works. In between the BSD and the GPL on the spectrum of restrictiveness, is the Mozilla Public licence (MPL). Changes to MPL-covered source must be made freely available on the Internet. The MPL, however, is non-viral: additions to (as opposed to modifications of) the 'MPL-licenced source' to create a larger work may be licenced differently and need not be published at all. Figure 4: Comparison of the three open-source licences. Can you still sell work that is available under an open source licence? An open-source developer can commercially licence software already available under an open-source licence. The commercial licence would 'sell' use of the software without the conditions imposed by the open source licence. This practice is known as dual-licensing. Open-source licences are not intended to ban commercial use. As a general rule, open source can be used commercially as long as the authors get a cut. However, commercial licencing can get complicated if the OSS has multiple components by different authors and under different licences. Are open-sources licences a waiver of rights? No, there is no waiver of rights. The open source licence is a unilateral contract which conditionally grants permission to exercise certain copyrights. Are open-source licences legally valid? There has been no direct legal challenge to open-source licences in Canada or in the United States. However, open-source licences are conceptually similar to clickwrap and shrinkwrap licences. All three licences are regarded as unilateral contracts. The software developer sets the terms and a potential licensee may 'unilaterally' take them or leave them. The three licences differ in the ways they are presented to and accepted by a user. Clickwrap licences utilise popup boxes. Whenever an individual attempts to install and/or run clickwrap software, a pop-up box opens up with instructions and the text of the licence. When the individual presses an 'OK' button, they have signalled their acceptance of the licence. Shrinkwrap licences are licences that are printed on the outside of software boxes or plastic 'shrink-wrap' packaging. Ostensibly, an individual reads the licence before opening the packaging and by proceeding to open the packaging the individual signals their acceptance of the licence. Open-source licences can be indicated to an individual in a number of different ways: in a README document, in the source code itself, in a popup when the compiled code is executed, etcetera. An individual indicates acceptance when they modify or distribute the software. Clickwrap licences have been upheld in Canada. In Rudder v. Microsoft , a clickwrap licence was found to be legally enforceable. The text of the clickwrap agreement was held to be analogous to 'fine print' in a written contract. Table 1: A comparison of the unilateral contracts used to licence software. Note that in ProCD and the other unilateral licence cases, the contentious issues were procedural. The question asked was, 'should the licencees have known what they were getting into?' The actual substantive terms of the licences were not in question. The terms and conditions of open source licences, such as the GPL, have not yet received judicial scrutiny and, as a result, remain legally uncertain. Most open-source licences are intended to be jurisdiction neutral; they contain no jurisdictional provisions. Jurisdictional provisions can be used to avoid jurisdictional complexity by establishing a choice-of-law rule by agreement. The presence of such provisions is helpful, but is ultimately not required. What are the advantages of OSS? Open-source developers have the opportunity to build on each other's ideas. The availability of OSS source code allows a worldwide community of open-source developers to participate in peer-distribution, peer-review, and peer-production. A program can be improved and redistributed ad infinitum, benefiting the entire community. As the open source model of openness and collaboration expands, the quality of OSS products also improves. The issue of overall quality aside, OSS has four inherent advantages over proprietary software. First, open-source software is considerably less expensive than proprietary alternatives. For example, Linux can be installed for free while Microsoft's Windows operating system can cost thousands of dollars a month to license. Second, access to underlying source code means users can detect and fix programming bugs; also, OSS can be tailored to a user's specific needs, and upgrades happen at a pace chosen by the user, not the vendor. Third, the transparency of OSS improves security because security flaws can be detected and corrected. Fourth, open source allows users to be flexible in their choice of vendors. If users are not happy with the service they receive from Red Hat, they can choose another Linux vendor. This prevents users from becoming overly dependent on their technology or support contracts. What are the disadvantages of OSS? The typical open source project contains contributions from many people. It is almost impossible to audit the entire code base for violations of previous licence conditions. This creates many opportunities for contributors to introduce infringing code. Thus this risk in the development process is largely borne by licencees. Contributors do not vouch for the integrity of the code they contribute to the project; in fact, the opposite is true -- the standard open-source licence is designed to be very protective of the contributor. The typical licence agreement does not include any intellectual property representations, warranties or indemnities in favour of the licencee; instead, it contains a broad disclaimer of all warranties that benefits the licensor/contributors. Recent litigation in the U.S. highlights this risk. There has been a flurry of lawsuits surrounding the SCO Group's (SCO) claim that its proprietary code was incorporated into the open-source Linux operating system. SCO has also claimed general invalidity of the GPL, although it is not clear that SCO will persist with this assertion. Some open source software projects, such as the Linux initiative, have one or more stewards who monitor code quality and track bugs. Other initiatives, however, are the product of hobbyists and do not enjoy the same code quality and rigorous testing protocol. Without contractual commitments of quality or fitness, the licencee must accept the risk that the software contains fatal errors, viruses or other problems that may have downstream financial consequences. As mentioned above, some open-source licences, such as the GPL, require licencees to provide royalty-free copies of their derivative works in source code form for others to use, modify and redistribute in accordance with the terms of the parent licence agreement (see Figure 3). This licensing condition makes it very difficult for companies in the commercial software business to use such open source software as a foundation for a business. As a result, companies may be concerned that the use of OSS within, or in connection to, their proprietary programs may convert their entire code base into a "derivative work" which would need to be made available royalty-free.